KAMPALA – The first Bombardier jet for the revived Uganda Airlines is scheduled to arrive in the country on April 23 according to Don Wanyama, the senior presidential press secretary. Mr. Wanyama did not give details of the remaining three Bombardiers. “…On April 23rd, at exactly 3pm, the first of the @UG_Airlines [Uganda Airlines] Bombardier CRJ900 will touch down at Entebbe International Airport,” he noted adding “and that, will mark the revival of the airlines,” reads a hist tweet. Last year, Uganda ordered for four CRJ900 regional jets with Bombardier Commercial Aircraft, as part of the much-anticipated plan for the revival of Uganda Airlines. 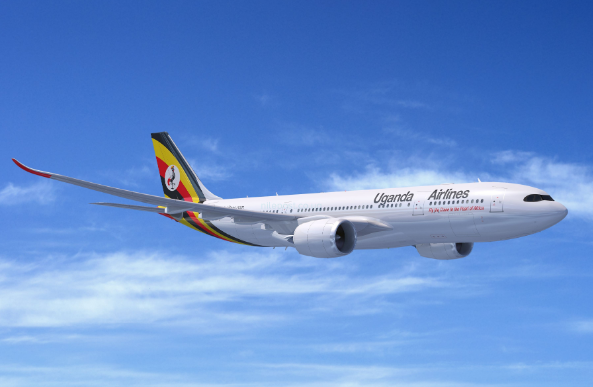 Mr. Ephraim Bagenda, the acting Uganda Airlines CEO said that upon arrival, Uganda Airlines will start the certification process which will take about two months. Uganda Airline first Bombardier CRJ-900 hit the skies for the first test flight from Montreal Mirabel international airport, Canada on February 17, 2019. An 8-minute video clip was uploaded on YouTube showing the test flight. The video clip triggered excitement among Ugandans. Uganda Airlines will start with 12 regional destinations. They include; Nairobi, Mombasa, Goma, Zanzibar, Dar es Salam, Harare, Mogadishu, Kigali, Kilimanjaro and Addis Ababa. Uganda’s revived airline will be the first carrier to operate the new CRJ-series Atmosphere cabin in Africa. The airline will operate the CRJ900 in dual-class configuration with 76 economy seats and 12 first class seats. Atmosphere cabin design allows passengers to carry and store an “oversized” roller bag within the aircraft cabin bins which minimizes the need to check bags at the counter or the gate.